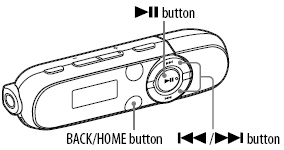 The player can be reset back to the default setting. Resetting the player does not delete the songs you have transferred to the player. COMPLETE appears and the player is reset to the default settings. To cancel the operation, select Cancel on the confirmation screen. Note: If the date and time have already been set under Set Date-Time, the date is not reset.